For Christmas each year, I make some sort of handmade gift for all the amazing women in my life. This year it was a variety of soaps and my award-winning lip balm (ok, maybe it hasn’t won any awards but IMHO it’s the best lip balm on the planet). I had so much fun creating and experimenting with new soap recipes including peppermint, lemongrass, citrus and honey and oats. I really love them all but perhaps my favorite is the pink grapefruit and clay soap. Grapefruit essential oil is a powerful antioxidant and can help with excessive oiliness, dryness, and blemishes. Pink clay is perfect for sensitive skin, as it has a gentle cleansing action that isn’t too harsh. Also, clay has the amazing ability to absorb toxins from the skin, such as dirt, makeup, bacteria, and oil. The pink grapefruit and clay soap smells amazing and it’s so refreshing when you’re just waking up with your morning shower – oh, and the lather is out of this world! It was almost a year ago that I learned how to make soap with my first recipe being a natural calendula soap. We adore our handmade soap so much, it’s all my family uses now. I love that I know exactly what’s in my soap and that it won’t dry out our skin like so many commercial soaps. Soap making can seem a little scary but as long as you follow the instructions and take the proper safety precautions you’ll be fine (was that convincing). Seriously, give it a try and let me know what you think. 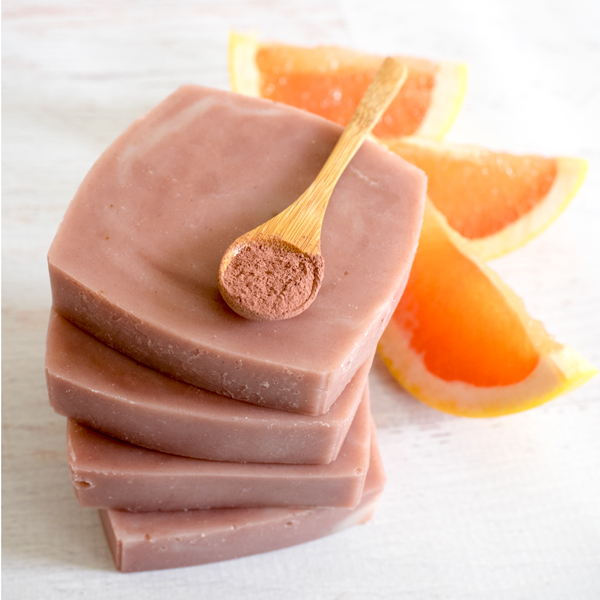 Download your Pink Grapefruite and Clay Soap Recipe here. Ingredients: *note – measurements are done by weight and not volume for better accuracy. 4 tsp of Grapefruit Essential Oils (EO’s are expensive so if you’re ok with grapefruit fragrance oil you can swap it here but I’d suggest leaving out fragrance if the people using it have sensitivities). Weigh cold water and place in a Pyrex measuring cup. Weigh oils and/or fat into stainless steel pot. Place on stovetop and turn on heat to lowest setting and keep an eye on the temperature with your thermometer. If you used cold water to mix your lye, it should now be somewhere around 150 degrees Fahrenheit and will be starting to cool. The object is to bring the lye and the oils simultaneously to a temperature in the range of between 110 – 115 degrees Fahrenheit. As long as they are both at the same temperature you should have no trouble getting your mixture to “trace”. Tracing refers to the soap mixture’s ability to hold a design on its surface. Start to mix the oils at a low-speed with the blender stick. Pour the lye into the mixture in a steady stream being careful not to splash. When the lye has been emptied into the pot continue stirring. Test for tracing by turning the blender stick off and lifting out of the mixture and drizzling across the surface of the soap. When the lines hold their form momentarily, you are ready to add scent and calendula flowers if you want to. *If adding scent, coloring or inclusions you must work quickly as your soap will begin to set up quickly at this stage and you need to get it into a mold! After 36 hours check your soap. It’s ready to remove from the mold when it has cooled and is completely opaque. If after 36 hours it’s solid but still quite soft, place in the freezer until frozen solid. When solid, tear away sides of the carton to reveal your gorgeous creation. Cut into bars using a large chef’s knife and allow to cure for 3 weeks before use (although it can be used before then – it just won’t last as long). Download your Pink Grapefruit and Clay Soap Recipe here. Say goodbye to chapped lips with this Copycat Burt’s Bees Moisturizing Lip Balm Recipe. Copycat Burt’s Bees Moisturizing Lip Balm Recipe – I don’t know about you but during the winter my poor lips take a beating from the cold weather. As soon as November hits, I’m having to apply copious amounts of lip balm to keep my lips from cracking. I have a few go-to favorite lip balms but recently I’ve been using Burt’s Bees Moisturizing Lip Balm most often and what I really like about it is that it isn’t overly waxy. Unfortunately, Burt’s Bees products are also very expensive (in my opinion). As much as I like these lip balms I figured I could probably come pretty close to making a similar recipe on my own. After reviewing the ingredients and researching other recipes, this is the recipe I came up with. It’s ridiculously moisturizing and seems to stay on well too. Now, I know there are recipes out there with fewer ingredients but if you want it to be most like Burt’s Bees then you’ll want to stick with the ingredients on the list below. The recipe is really easy to put together and from start to finish only takes about 15 minutes to make. Everyone that I’ve given these lip balms to rave about how great they are and how it’s saved their lips so far this winter. I keep one in my office, one on my bedside table and one in my purse so I’m never without. These amazing moisturizing lip balms also make great gifts or stocking stuffers. Makes approximately 10 tubes of lip balm. Slowly heat the cocoa butter, beeswax, coconut oil, Shea butter and lanolin over low-medium heat in a double boiler until melted (a small canning jar in a pot of water works too). Add essential oil and stir well. Pour mixture into containers while still in a viscous liquid. Allow to cool in containers and then cap. Download my Copycat Burt’s Bees Moisturizing Lip Balm Recipe here. DIY Shaving Cream – Over the past few months I’ve had two almost new cans of shaving cream that have just died on me. They were 3/4’s full of cream but there was no pressure pushing the cream out. It irritated me because I’m not a huge fan of shaving cream as it is and it seemed like a silly waste. I’d been playing around with the idea of making my own cream for a while so this final can malfunction pushed me over the edge. I looked up a bunch of homemade shaving cream recipes and in the end came up with my own formula. Once I had gathered the few ingredients I needed, I got to work. When my first batch of DIY shaving cream was complete I divided the recipe in half, taking half for myself and giving the rest to my unsuspecting guinea pig, my mother-in-law, Lynda. The first time I used the shaving cream I was a little surprised by the consistency and feel on my skin. It felt light and airy but also rich and buttery. I had expected a little foam or suds from the castile soap in the recipe but it never really foamed at all. It definitely has more of a cream consistency but once I adapted to it, I fell in love. This silky smooth cream is the perfect emollient for shaving and leaves your legs feeling really soft and moisturized. After the first two tries with my DIY shaving cream, I was hooked. I was curious what Lynda thought of the homemade shaving cream and after a quick phone call I was thrilled when she asked me to make a second batch for her. She loved it too! So here’s my recipe that I’d like to share. You only need a handful of ingredients to make this luscious homemade shaving cream. I hope you enjoy it as much as I do. 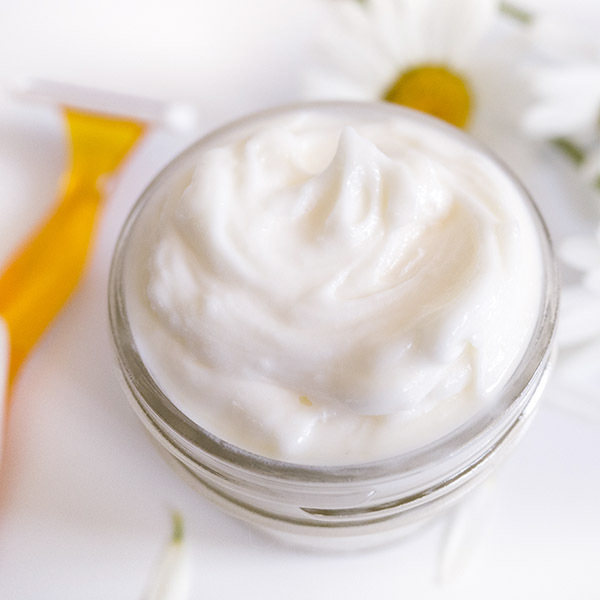 Download your DIY Shaving Cream Recipe here. In a heat resistant pot, put the measured out portions of shea butter and coconut oil on the stove top over low heat. Stir until melted. Put mixing bowl in fridge and leave until the ingredients have solidified (about 2-3 hours). Remove bowl from fridge, and using a hand blender, blend the mixture until it become soft and fluffy (approx 2-3 mins). Natural Calendula Soap Recipe – This year for Christmas I gave all the ladies in my life handmade bath and beauty products. I really enjoyed making them and it felt good giving items that I knew were all natural and free of harsh chemicals. 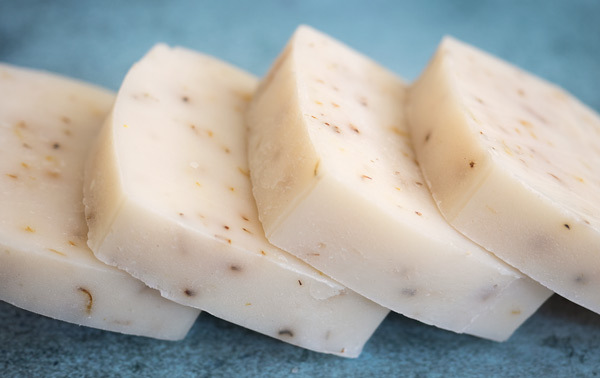 One product I really enjoyed making was soap but, even though I made the soap from scratch, it came as a kit which was all perfectly measured out and ready to be made – it sort of felt like I was cheating. Luckily I have some pretty amazing, talented and resourceful people in my life including my friend Deborah who has been making her own soap since the late 90’s. She was kind enough to invite me over to her house last week to show me how she made her favorite recipe from scratch. She got this recipe from a basic soap making course she took many years ago. Deborah says that she’s tried many recipes but she always comes back to this one. It’s a simple recipe with only a few ingredients – great for people with skin allergies or sensitivities. In this particular recipe we’ve added dried Calendula. Calendula has a long history of use as a wound-healing and skin-soothing botanical. This beautiful yellow and orange flower is particularly good for cuts, scrapes, bruises, sunburns, irritated skin and acne. Even though Calendula is loaded with powerful skin-healing and anti-inflammatory properties, it’s gentle on most people’s skin. This recipe needs to be mixed at 135-140 degrees Fahrenheit. Makes approximately 3 lbs. 0.8 oz. (25 mL) Essential Oils or Fragrance Oil (EO’s are expensive so I don’t use nearly that much although you need at least 50 drops of EO if you want to smell the scent of the EO in the soap). Also I’d suggest leaving out EO’s or fragrance if the people using it have sensitivities. Weigh oils and/or fat into stainless steel pot. Place on stove-top and turn on heat to lowest setting and keep an eye on the temperature with your thermometer. If you used cold water to mix your lye, it should now be somewhere around 150 degrees Fahrenheit and will be starting to cool. The object is to bring the lye and the oils simultaneously to a temperature in the range of between 110 – 120 degrees Fahrenheit. As long as they are both at the same temperature you should have no trouble getting your mixture to “trace”. Tracing refers to the soap mixture’s ability to hold a design on its surface. Start to mix the oils at a low-speed with the blender stick. Pour the lye into the mixture in a steady stream being careful not to splash. When the lye has been emptied into the pot continue stirring. Test for tracing by turning the blender stick off and lifting out of the mixture and drizzling across the surface of soap. When the lines hold their form momentarily, you are ready to add scent and calendula flowers if you want to. *If adding scent, coloring or inclusions you must work quickly as your soap will begin to set up quickly at this stage and you need to get it into a mold! After 24 hours check your soap. It’s ready to remove from the mold when it has cooled and is completely opaque. If after 24 hours it’s solid but still quite soft, place in the freezer until frozen solid. When solid, tear away sides of the carton to reveal your gorgeous creation. Cut into bars using a large chef’s knife and allow to cure for 3 weeks before use (although it can be used before then – it just won’t last as long). Download the Natural Calendula Soap Recipe HERE.